Lock in a great price for Donatello Hotel – rated 8.1 by recent guests! The hotel is in very good location. The room is spacious and very comfy. I like the location and also the availibility of the parking for my rented car. I prefer this area albarsh more than rge downtown. Jearim as Sales Manger had great hospitality and I would like to thanks him for his kindness. Also Shahadat was very helpful. Thank you all. Check in and staff, professional and polite. Vivien was very nice at check in and the gentleman working with her made us feel very welcome as well. On day of checkout had the best experience with "Immacukate" she went above and beyond to make us feel welcome and so helpfu! People like her are the ones that get this couple to suggest Donatello to others! Lastly, the room! Super comfortable! Bed excellent, bathtub! Really beyond expectation! Thank you for a great stay! "immaculate" at reception your service as indeed immaculate! Donatello Hotel This rating is a reflection of how the property compares to the industry standard when it comes to price, facilities and services available. It's based on a self-evaluation by the property. Use this rating to help choose your stay! Located midway between downtown Dubai and Dubai Marina, Donatello Hotel offers elegant rooms with an LCD TV. Facilities include a rooftop pool, a well-equipped gym. Free Wi-Fi is available in the suites. The air-conditioned rooms and suites of Donatello Hotel feature a modern interior and a spacious bathroom. The concierge can arrange desert safaris, excursions, and guided tours. The hotel also offers free internet access in all rooms. Donatello Hotel has 2 trendy restaurants, which serve local and international gourmet cuisine. Guests can also order à la carte dishes through room service. Donatello Hotel is a 10-minute walk from the Mall of the Emirates & Ski Dubai. 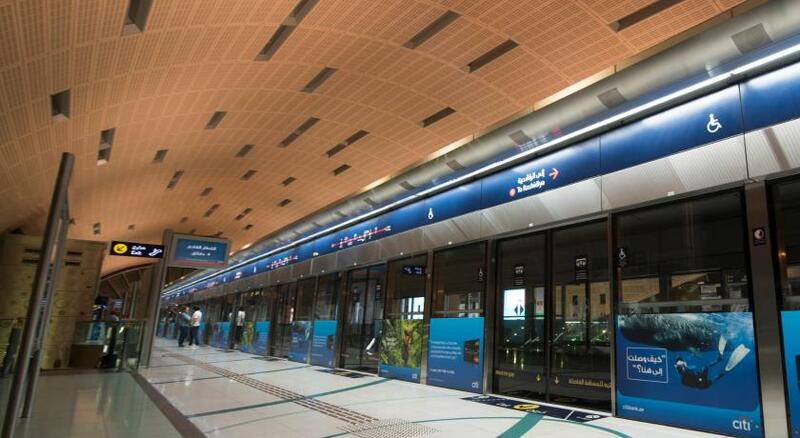 The Mall of Emirates Metro Stop is less than 1,650 feet from the hotel, and the Sharaf DG Metro Station is 650 feet away. Al Barsha is a great choice for travelers interested in clothes shopping, shopping and entertainment. When would you like to stay at Donatello Hotel? This modern room features a comfortable seating area, mini-bar, flat-screen TV, and an private bathroom with bathtub. Free WiFi internet connection is available in the room. The room rate is for 2 adults but can also accommodate 1 child. To have the room for 3 adults an extra bed should be added at an extra charge. This modern room features include a comfortable seating area, mini-bar, flat-screen TV, and an private bathroom with bathtub. Free WiFi internet connection is available in the room. The room rate is for 2 adults but can also accommodate 1 child. To have the room for 3 adults, an extra bed should be added at an extra charge. This modern suite features a spacious seating area, balcony, mini-bar, flat-screen TV, and an private bathroom with bathtub. Free WiFi internet connection is available in the room. The suite rate is for 2 adults but can also accommodate 1 child. To have the suite for 3 adults an extra bed should be added at an extra charge. This spacious suite features a comfortable living room with TV, dining table, mini-bar, flat-screen TV, and an private bathroom with bathtub. Free WiFi internet connection is available in the room. This luxurious suite features an extra spacious living room with TV, dining area, mini-bar, balcony, flat-screen TV, and a modern private bathroom with a bathtub. Free WiFi internet connection is available in the room. This twin room has air conditioning, seating area and mini-bar. Donatello Hotel is a 10-minute walk from the Mall of the Emirates & Ski Dubai. The Mall of Emirates Metro Stop is less than 500 metres from the hotel, and the Sharaf DG Metro Station is 200 metres away. Hotel surroundings – This neighborhood is a great choice for travelers interested in clothes shopping, shopping and entertainment – Check location Great location - show map Guests loved walking around the neighborhood! House Rules Donatello Hotel takes special requests – add in the next step! A AED500 damage deposit is required on arrival (around USD136.12). This deposit will be fully refunded at check-out, as long as there isn't any damage to the property. Donatello Hotel accepts these cards and reserves the right to temporarily hold an amount prior to arrival. A deposit is required upon check-in to cover extras consumed during the stay. Please be advised that currently there are construction projects in progress by privately owned buildings near the Donatello Hotel. The construction works normally take place during daytime (between 06:00 AM to 08:00 PM). A damage deposit of AED 500 is required on arrival. That's about 136.12USD. This will be collected as a cash payment. You should be reimbursed on check-out. Your deposit will be refunded in full, in cash, subject to an inspection of the property. Big rooms , Big TV Screen , Big Bathroom , King size bed Suitable desk for work . Good lighting , The Atrium in the hotel gives value to the hotel . Walking distance from MOE . staff, location, clean place and services. I Enjoyed my stay and hotel staff were very helpful. It wasn't clear how much the tax is? I didn’t like the noise that we were hearing from the window, even if it was closed. Like a big air conditioning or a machinery, i don’t know exactly what it was. I like very much the employees that were very friendly and gentle. Also we had a big room with a king bed that was actually a double bed of around 3m, very comfortable for 2 adults and 1 kid. Good breakfast.